Shares in luxury carmaker Aston Martin have skidded lower after it made its stock market debut. The British company - famous for making James Bond's cars - was valued at £4.3bn or £19 a share as it began trading on the London stock exchange. But it fell by as much as 6.5% in morning trading as investors and analysts expressed concerns that the business may find it hard to deliver on the ambitious rollout of new models. It closed the day 4.7% down. The initial offer price of £19 a share was itself lower than the top end of the £17.50 to £22.50 range that it had put forward last month. That would have seen the manufacturer - famous for making James Bond's cars - valued at more than £5bn. Now, the carmaker looks set to miss out on inclusion in the FTSE 100 when the stock exchange has its next reshuffle in December, as it would fall short of the required market valuation. Aston Martin chief executive Andy Palmer described the float as a "historic milestone" and said there had been a "positive response from investors across the world" as it prepared to make its debut. The company, which last year made its first profit since 2010, has gone bankrupt seven times in its history. The float sees it sell about a quarter of its existing stock. Its main owners are the Italian investment firm Invest industrial and a group of Kuwaiti-based investors. Aston Martin reported a pre-tax profit of £20.8m for the first half of this year on revenue of £449.9m. Jasper Lawler of London Capital Group said: "The first public listing of a British carmaker in decades has the kind of 'dinner party' appeal that few IPOs share. 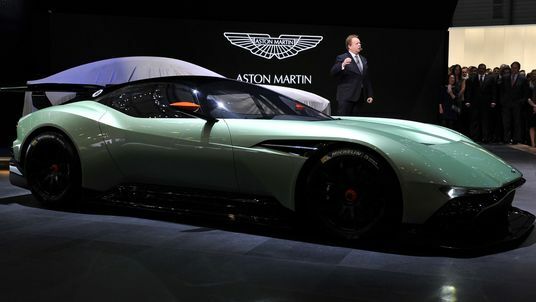 "Aston Martin is one of the most hotly anticipated IPOs this year." But Russ Mould, investment director at AJ Bell, said it appeared to have been "priced on too high a valuation versus its growth prospects". He added: "Aston Martin has a very aggressive expansion plan which means the bar has been set very high in terms of market expectations."